Who wouldn't push their granny in a ditch for this? Or something. Ahem. If you crave the rush of adrenaline that comes from driving high-end cars in real-world locales, Grand Theft Auto 5 is for you. When you do get your hands on the game or even when you gaze at the screenshots below, you'll want to know more about the tech in these stunning, well-equipped luxury models. 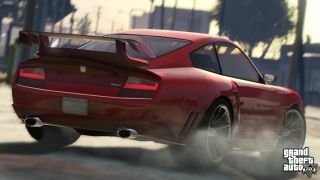 So here for your delight are eight great cars featured in GTA 5, complete with images from the game and the real world, plus their real-life technical details. This well-regarded BMW has the tech features you'd expect from the German automobile maker. Bluetooth Audio is standard, of course - but on a BMW 3, the stream actually sounds palatable and consistent. (In the real car, your phone will sync quickly and stay synced.) Safety features include tail-lights that glow brighter when you press down hard (we'll see if GTA mimics that design spec). Dynamic Cruise Control automatically adjusts speed around corners, providing extra comfort. Oh, and the car supports HD Radio. The distinctive tail of a Corvette shows up only briefly in the GTA 5 trailer. We hope it's the re-introduced Corvette 427, which uses carbon fibre parts on the front hood, fenders and floor panels. The ride is tech-laden as well: as you drive, magnetorheological fluids (MR fluids) in the shock absorbers can adjust the suspension 1,000 times per second on corners. This sporty convertible offers a pop-up HUD that shows your speed and even whether the adaptive cruise control is enabled. The seat belts have an embedded Bluetooth microphone so you can speed down a winding road and talk to your kids at the same time. Oh, and don't forget this model has a 465 watt Bang & Olufsen surround-sound stereo system. If you get a chance to drive the Quattroporte in the game, be sure to test out some of the high-end tech features. The car uses a unique 'anti-squat' and 'anti-dive' suspension that prevents the vehicle from lunging when you drive around corners. Just as important, the car has a 'comfort' setting that automatically stabilises the car as you drive. As with any high-end sports car, the Vantage Roadster has options like carbon fibre front splitters and rear diffusers. But the car is also enhanced by technology. As an option, the Vantage can auto-dim the rear-view mirror when you press the garage door button. An alarm upgrade senses if the car is being tilted too much in a theft. And the 1,000 watt stereo system - once again, it's a Bang & Olufsen - makes day trips more entertaining. We all know this sports car looks stunning. What might surprise you is how technically advanced it is. Koenigsegg designs not just the engine and styling, but all of the electrical components - which are highly integrated. That means that if a front lamp is broken or a roof lock is not secure, you'll see an alert on the dash. Another perk is that the battery can sense when a control panel feature such as the parking brake is left on by mistake, and can cut power to save it from running down. Sure, this stunner is fun to drive. In recent years, Porsche has also started adding interesting tech perks. The latest model has a 7-inch touchscreen that's highly responsive. A new Aha Radio app for the 911 means you can stream internet radio stations, podcasts and even audiobooks. Importantly, the interface runs on the dash itself but uses your smartphone. Read: Porsche Cayman: perfect fusion of analogue and digital driving? Yes, we saved the best for last. Sure, the game developers adjusted the look of the car - licensing the look of an actual Ferrari is probably quite expensive. The big tech advancement here is the way the car was designed to be lighter and nimbler. The car handles the same as previous generations, and is just as rigid, but now weighs a full 30kg (66lbs) less.